Boehner on Norquist, the "Random Person"
There was some unexpected levity in Speaker of the House John Boehner’s weekly presser, after NBC’s Luke Russert mentioned that Grover Norquist, the paterfamilias of the GOP anti-tax pledges, was making rounds on the Hill. Did the Speaker think that Norquist was a positive influence on Republicans? Boehner twisted his mouth, wrestling with the premise of the question. BOEHNER: Our focus here is on jobs. We’re doing everything I can to get our economy going, to get people back to work. It’s not often I’m asked about some random person. RUSSERT: To your conference, is Grover Norquist a random person? BOEHNER: Listen, our focus is on creating jobs, not talking about somebody’s personality. RUSSERT: But what he stands for, is that a positive influence on your conference? 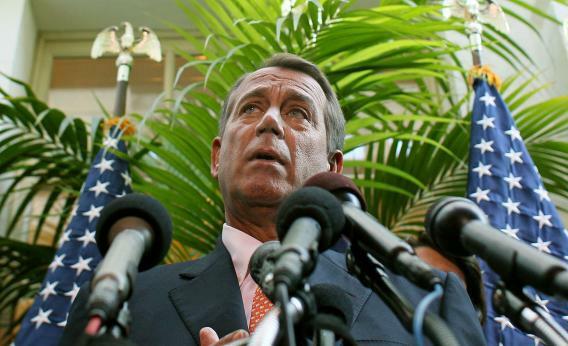 BOEHNER: What he stands for? RUSSERT: Yes, his no tax hikes under any circumstances pledge. Is that positive for your conference? BOEHNER: Our conference is opposed to tax hikes because we believe that tax hikes will hurt our economy and put Americans out of work. It was… strange. Before the Biden talks collapsed over a possible debt deal, Boehner had reportedly come to the table (ah, that cliche again) on a deal to cut $4 trillion over 10 years, as long as tax reform was part of the plan. He walked away after the White House demanded more revenue-raising, through taxes, than Boehner would accept. Now, how much of that was Boehner’s reluctance to tax hikes, how much was the knowledge that Republicans – at least before the debt deal took everyone to the cleaners – were reluctant to tax hikes, and how much was fear of retribution from the Fifth Estate of conservative interest groups represented best by Norquist? A lot of Norquist’s influence is historical: He has won the argument on taxes, and Republicans do not cross him because they agree with him. I asked Boehner a sort of related question, keying off the one-year anniversary of the GOP’s midterm victory. One year in, what had been the impact of austerity and a spending-cut focus on jobs? The job market was stagnant. That’s the thing: Norquist aside, this is what Republicans believe.